Do you love soup? I love soup. It's warm, comforting yumminess. Some soups can be made on the fly, others need to simmer for hours. Many soups taste better after a day in the fridge so all the flavors blend and deepen. When I'm sick, I carve soup. Sad? Yep, soup again. Cold weather rolls in? Soup saves the day! Here are ten soup recipes my family loves. Why not stir up a pot for yourself? We love Panera Bread! Since it's arrival in Lubbock, it has quickly become my newest obsession. Their Broccoli Cheddar Soup is a hit with the whole house. Little Miss lists broccoli cheese soup as her favorite, no matter where it comes from, so I'm always on the look out for a good recipe. This is a recipe I created after the little eatery I first tasted it in closed down. It took some trial and error, but I finally managed to get pretty close to replicating the flavor I so loved. It is a go to when it's cold out. Though it can be made with canned tamales, I mush prefer using the fresh or frozen variety. You can use pork, beef, chicken, whatever your family prefers. We love King Ranch Chicken Casserole in this house. It's a favorite, especially during the chilly months. When I first saw a friend talking about this recipe on Facebook, I knew I needed to try it. 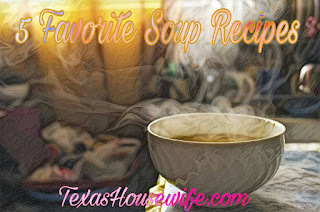 A favorite casserole turned yummy soup? Yes, please! Another family favorite main dish turned soup! I love these recipes! This one packs all the the flavor of stuffed bell peppers into a steaming bowl of goodness. Grab some crusty bread and go to town, my friends! This recipe was born when I needed to use up leftovers. It turned out amazing, is quick, and is about as frugal as it gets. This is my go to rather than chicken noodle when the sniffles take over my home.